From left: the Rev. Steven Kelly of St. John’s Episcopal Church in Detroit; the Rev. 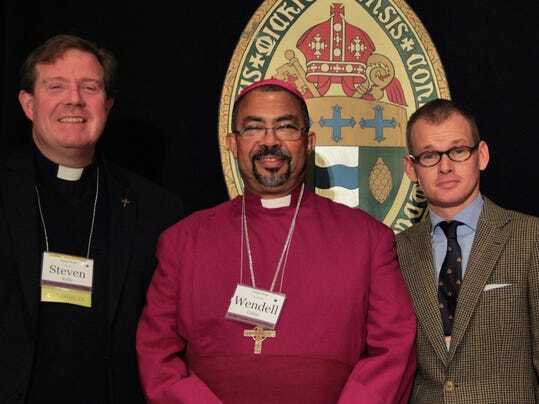 Wendell Gibbs Jr., bishop of the Episcopal Diocese of Michigan; and Dennis Lennox, a member of St. John’s Episcopal Church, at the 180th annual convention of the Episcopal Diocese of Michigan. By a clear majority, members of the Episcopal Diocese of Michigan — which consists of southeast Michigan and the Lansing and Jackson areas — voted recently to approve a resolution calling for universal background checks on all gun purchases, banning all sales of semiautomatic weapons, high-impact ammunition, high-capacity ammunition magazines, and making gun trafficking a federal crime. "banning all sales of semiautomatic weapons"
How do you explain this line? Not sure why you omitted the option dictated by Occam's Razor--that they meant what they said, and want to ban all sales of semi-automatic weapons. And sure, that would be the act of "evil and fanatical gun grabbers," as you call them, but it wouldn't "essentially ban all guns." That's number 3. Naturally you opt for that one, being an honest person who never finds the need to lie. OK, OK, it wouldn't ban all guns, just most. Except revolvers, pump shotguns (and a few rifles), bolt action rifles (and a few shotguns), lever action rifles (and a few shotguns), double-barreled rifles and shotguns, drillings and other triple-barreled guns, single-shot pistols, rifles, and shotguns, all fully-automatic guns (except perhaps select-fire models, that have a semi-automatic mode), etc. Isn't it you who accuse us of exaggerating in our use of the word "ban"? If I had called the Michigan Episcopal Church's position on guns an attempt to "essentially ban all guns," would you not call me a "liar" for doing so? That accusation would, unlike the ones you actually make against me, be justified. To put it another way, if the church's silly fantasy of a semi-auto ban actually came about somewhere, and gun rights advocates challenged it in court on Second Amendment grounds, the legal team defending the law would almost certainly rely in large part on the argument that since many guns would not be banned, the people's right to keep and bear arms is not burdened to an impermissible degree. Would you dispute that argument? Kurt, once again you've succeeded in getting us way off track. The point is not whether or not semi-automatic guns constitute "most" or not. I believe they do, but the point of the post was what did the Episcopals mean by "banning all sales of semiautomatic weapons." Is your contention now that it was a bumbling and badly worded attempt to ban all guns?
. . . the point of the post was what did the Episcopals mean by "banning all sales of semiautomatic weapons."
. . . they meant what they said, and want to ban all sales of semi-automatic weapons. I can't imagine how that could be the least bit ambiguous. No--where do you get this stuff? They said they want to ban sales of semi-autos. I take them at their word. I don't think it to be either an incompetent attempt to "ban all guns," or a stealthy attempt to do so--I think it's an attempt to ban (with a grandfather clause, presumably) semi-autos, just as they say. That, of course, is itself utterly intolerable--even if I were not scrupulously honest, there is precisely zero need to exaggerate it into an attempt to ban all guns, for the idea, and the people behind it, to deserve the harshest condemnation. Again, I view this as an option you don't offer in your list--it ain't number three, even with your quick moving of the goal posts from "essentially ban all guns" to a ban of "most" guns, because I don't think that's the intention, and I note that they're pretty open about wanting the semi-auto ban--they didn't "slip this in there." I do admit to mild curiosity over what the hell they mean by "high-impact ammunition"--that, I suspect, is a manifestation of them their being utterly clueless. Kurt: "I do admit to mild curiosity over what the hell they mean by "high-impact ammunition"--that, I suspect, is a manifestation of them their being utterly clueless." Hard primers? I was wondering about that myself. "I do admit to mild curiosity over what the hell they mean by "high-impact ammunition"
I later saw that they were referring to ammunition more powerful than needed for hunting. So that means .700 Nitro is good to go- I guess they just want to ban the 20mm Vulcan’s already highly restrictive NFA sales. Ah--thanks for the info, TS. Now we just need a World's Strongest Man contestant to say he needs a .950 JDJ for his Dreadnoughtus schrani hunt (in case they're not really extinct--just . . . elusive). How do you explain this line?" My guess is its the person who wrote the article. Further down the details of the debate pretty clearly show that the intent is the complete ban of military style semi-automatic weapons. Though even that definition is pretty vague considering that most features that are used to define them are an appearance thing. Unfortunately, most of the other media sources mentioning it cite the article written by the same author. It wasn't slipped in considering the mention of a heated debate. They want to ban all semiautos. But as we know, bolt action guns can still be useful. I see the fake orlin sellers is back.